Let’s be honest. There really wasn’t much Dakar to taste here. I’ve attended the last 3 years and although the newer location in Goldpoint is much better, the structure of the event provides zero “rally”components. Like I said the current venue is super cool, the terrain is great and it draws a group of really cool people. But it is pretty pricy for what really amounts to 1 day of riding on mostly maintained roads. The Cycle World Rally down in Julian was more of a taste with its team based structure, waypoints, and point scoring system. (Oh and don’t forget the bottomless sand) And it was dirt cheap for two VERY full days of riding, printed maps & navigation aid books. Alt Rider’s event has a TON of potential but misses the mark a bit for me. So all in all, I won’t be super disappointed to get my refund for this years event. Also why couldn’t I find anything on their website about the cancellation? And the event link from a Jan 17 post goes nowhere. Yea, it was the most expensive of the rides I attend. A little sad on the cancellation. Was never a rally style event. The taste was the sand/desert riding that was new to most. And the first years having Jimmy Lewis as part of the event. Eric, found your next house where you can host Dakar rallies. I love the CycleWorld rides! Attended the event at China Peak several years in a row... Best "Group Ride" / event I have ever attended. Nah, I wouldn't swoop in on their event like that. They worked hard to do this for like 7 years. Not sure why they cancelled the event. I was part of it for many years in helping them promote the event and doing tracks for 2 or 3 years when Jimmy bowed out. Sure, it wasn't truly a taste of the Dakar rally in that it wasn't rally raid with road book navigation but it was still a "taste." Part of that taste was in the guest speakers being current/former Dakar competitors. I was actually the one (and Curtis Cummings) who convinced them to move it to Gold Point as Joel's AOLRider event he does in Pahrump every November was essentially becoming a "poor man's Taste of Dakar" even complete with training from Jimmy Lewis so we had to up the ante with a fresh location. Plus, we were running out of finding new ways to ride to and from the Pioneer Saloon without retracing prior year's tracks. I always had a good time as did most other people but I feel the complaints about the cost and raised that issue years ago. I said for less than half the price with the Touratech rally you get an extra day of riding even in you have to buy your own food. And don't charge $300 and then have a sign saying "dinner provided by Icon Raiden." People aren't stupid; they see in the front office a tent spot costs $17/night so they're like if Icon Raiden paid for the dinner then what is my $300 paying for? 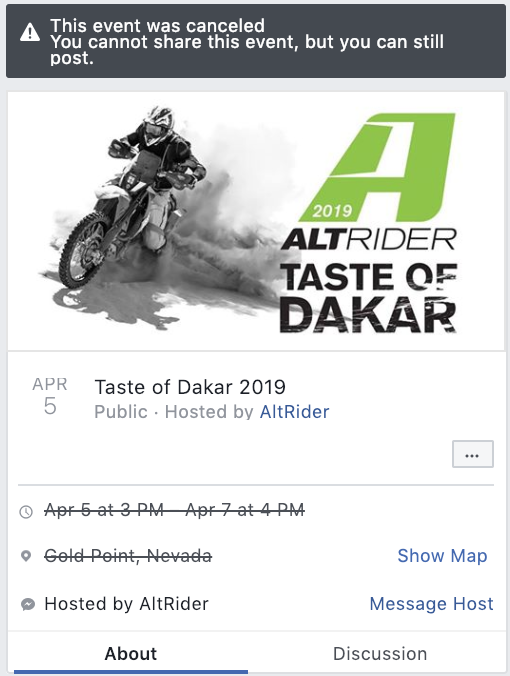 I can do this event and still make a meager profit for $150 but I thought the idea was AltRider would do it as a loss leader for the marketing value and not a profit. Want to know what I heard back? "But if we're selling out then are we really wrong to charge that much?" Have to admit they got me there. I think the fact it sold so well (not sure every year "sold out") is a testament to the added value they were able to communicate. That's marketing! It's an enviable position to be in. @Manybikes and @greedyg say they loved the ADV Rally put on by Bonnier but look at what they did... It used to be a $400 event! They had maybe 80 people (not bad). So they de-coupled the food and lodging, brought the price down to $50 and had something like 200 people come! And they were charging an arm and a leg for vendor space. It is what it is I guess. I am proud of our Mojave and High Sierra events though. I think that is a fantastic value you don't see many other places. BTW, Mojave is a go as I just got confirmation for May 3-5.